Posted on 10 Mar 2017. I've been really happy to be working with two incredible musicians over the past year. It's always a pleasure to play with my regular collaborator David Lyttle, especially when we added world-class bassist John Goldsby. John is one of the greatest bass players in Europe (scratch that, the world!) and it's an incredible experience to play with him. Our first collaboration in 2016 included a tour of Ireland, including an appearance at Derry Jazz Festival. Later that year we also did some gigs in Germany. 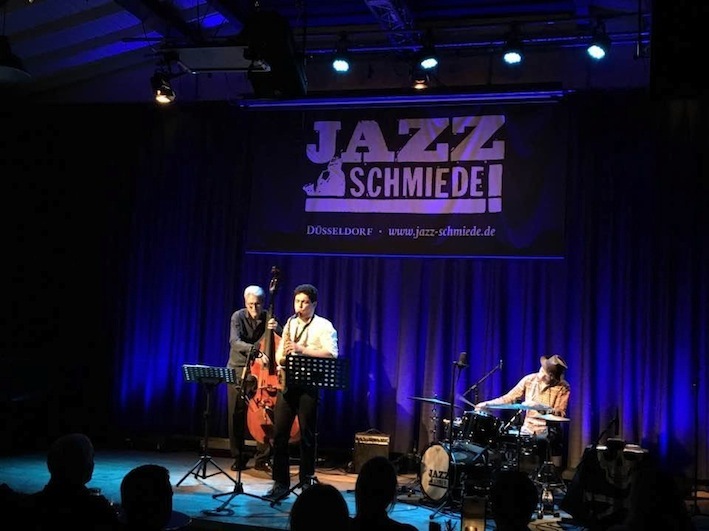 Our Dusseldorf concert was at the Jazz Schmiede, a great club. We were very lucky that Lars Wallat, their sound engineer filmed, recorded and mixed the show. We thought he did such a great job, we've had some of the footage uploaded to Youtube! The first tune we uploaded was 'Perpetual Scenario,' a new original composition by David. The second is 'Wonderland' by the great Benny Carter, a pretty tune that isn't so well known. Hope you like them! Check out John Goldsby at www.john.goldsby.de.